This recent publication by our Chairman Nicholas Sims-Williams represents a landmark in the study of Christian Sogdian and at the same time is designed to be accessible both to Iranists, whether or not they know Syriac, and to Syriacists, whether or not they know Sogdian. The present Dictionary consists of two main sections followed by a comprehensive English index. Part 1, arranged by Sogdian lemmata, provides a complete listing of all words attested in published Christian Sogdian texts, both in Syriac and in Sogdian script, including variant spellings, full parsing of all inflected forms, and details of their equivalents in the most closely corresponding Syriac parallel text. In Part 2 the same material is arranged by Syriac lemmata. The two parts together make it possible to see what Syriac form or forms any Sogdian word can represent and how any Syriac word or idiom is translated into Sogdian. The dictionary thus fulfils a range of functions. Firstly, it will provide a reliable guide for anyone who wants to read the extant Christian Sogdian texts; secondly, it will assist future editors in identifying, restoring and translating Christian Sogdian texts; and thirdly, it will contribute to the study of the transmission of literature from Syriac into Sogdian and the techniques of the translators. The majority of the Christian Sogdian texts from which the dictionary is compiled can be viewed online on the Turfanforschung Digital Archive or on the International Dunhuang Project Database. In a recent post on facebook, we highlighted Professor Fung Kam Wing’s donation of this two-volume publicatin of the Hong Kong Maritime Museum. 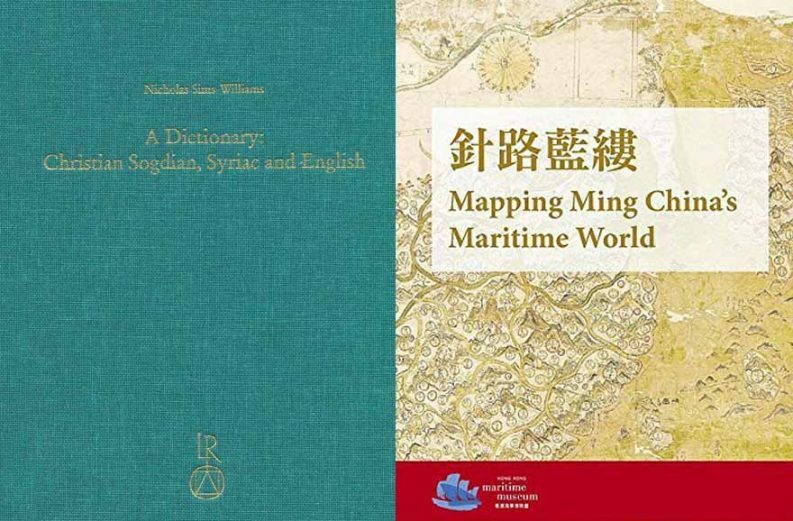 Based on a 2014 international exhibition and symposium: Mapping Ming China’s Maritime World – The Selden Map and Treasures from University of Oxford, this 2-volume set presents a multidisciplinary approach to the sixteenth-century map bring to light the latest research on the historical implications of the Selden Map of China and rutters, underwater archaeology, seafaring and maritime trade, and the relationship between China and Southeast Asia during the Ming dynasty. The book set also reprints in colour the Selden Map and other navigation charts, manuscripts of two Chinese rutters, and a selection of export porcelain. Volume I is primarily a catalogue of the exhibition , and volume II contains the proceedings of the nineteen papers presented at the symposium. Further information about the Selden map is available on a dedicated website: http://seldenmap.bodleian.ox.ac.uk/about/.